This peak is #8 on the Height List for Alberta . This peak is #8 in Prominence List for Alberta .See the "Height Notes for Mount Temple" for source of height. 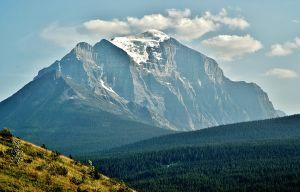 Mount Temple is the highest peak in the Bow Range, and for many climbers is their first peak over 11,000'. From the Trans Canada highway to the north one sees a most impressive north ridge and North Face, complete with a mantle of hanging glaciers, right from the summit. The tourist route is the SW face, which is accessed from Moraine Lake (the scene on the old 20 dollar bill), then up to Sentinel Pass, traversing east onto the scree. For most day trippers it's a scramble in the scree, and then a long stagger to the summit. However the weather should not be underestimated. Name Notes: Named in 1884 by George M. Dawson after Sir Richard Temple who was the leader of the British Association Excursion Party that visited the Rockies in 1884.